Nullification is the idea that states can reject unconstitutional federal laws - and a foundation of American liberty. The political agenda of the old liberals was not merely to limit the size of the government but also its scope. That means that lower orders of government have rights against higher ones. In the American context, that means that the state can tell the federal government that its laws are invalid - that is, a state can nullify a federal law.. 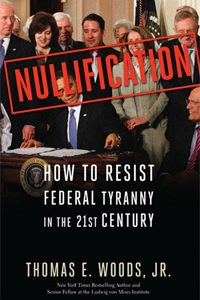 In Nullification: How to Resist Federal Tyranny in the 21st Century, historian and New York Times bestselling author Thomas E. Woods, Jr. explains not only why nullification is the constitutional tool the Founders envisioned, but how it works. The book shows how state nullification has been used on behalf of free speech and free trade, and against unconstitutional searches and seizures, federalization of the militia for offensive purposes, the prospect of military conscription, and the worst outrages of the fugitive-slave laws. The point of the book is not that the states are necessarily wise or legitimate -- they are states, after all -- but that competing jurisdictions are likely to give liberty more breathing room than a single, giant one. After all, Woods reminds us, liberty developed in Western Europe because a multiplicity of small jurisdictions made it easy for people to flee oppressive places -- thereby depriving them of their tax base -- and settle in more liberal ones. The idea was not incidental to the American experience. Woods shows that it was central to the structure of American liberty. Without it, the entire population is subject to the whim of federal masters. With it, there is a check on power. Woods thereby argues that the idea must be revived in an effort to reclaim liberty. Nullification is not just a book—it could become a movement to restore the proper limits of the federal government. Powerful, provocative, and timely, Nullification is sure to stir debate and become a constitutional handbook for all liberty-loving Americans.